Finding a large enough space to hold executive meetings can often be a challenge. At the M1 Business, we strive to take the hassle out of your experience by providing a professional environment so you, your clients and/or board of directors get the best result from your meeting. Centrally located and well-equipped, it delivers the comfort and the amenities you need to accomplish any task. M1 Business makes it simple for organisations of every size to access a state-of-the-art meeting room. Whether you’re a sole trader looking to close a major deal or a small business seeking a properly furnished environment to meet with suppliers or partners, we’re the ideal choice for you. With competitive rates and extensive inclusions, we make giving your next venue that crucial professional touch something everyone can afford. Speak to our team today to find out how we could provide the services you need to make your next meeting a productive success. Our Boardroom combines sophistication, the latest technology and catered services into one affordable package. Holding up to 16 people comfortably, and capable of being configured in several different ways to suit every business’ individual needs, it’s the versatile choice for organisations of every size. Whether you’re booking a product pitch, a quarterly review or a meeting of the board, M1 Business has the solution. 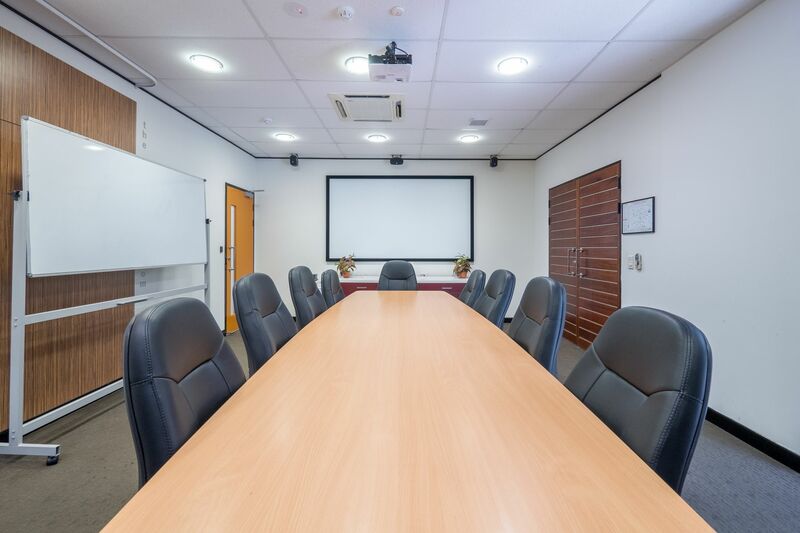 The preferred meeting space for people across Brisbane and the Gold Coast, it’s the superior choice for your business.